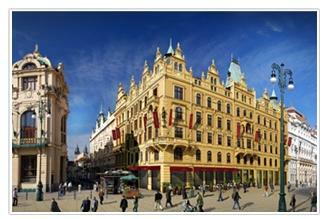 Hotel Kings Court, Prague. Kings Court Hotel Prague. The five star, luxury Hotels Kings Courts is found in one of Prague's most elegant neighbourhoods and offers top of the line services and amenities for those travelling to the historic city for leisure or business. The facility was extensively remodelled from an original seat of the chamber of commerce and now offers the perfect destination for travellers. The hotel offers business facilities for those who need to organise events, meetings, gatherings or seminars. The elegant accommodations offer unforgettable views over the city, sure to offer a memorable stay. A ball room, boardroom, and conference rooms are at your disposition to organise all types of events or gala evenings. The hotel spa is the ideal place to come an enjoy one of many treatments, special pool, Jacuzzi, Finnish & Turkish saunas and fitness room. The ideal way to spend an afternoon after an exciting day of touting around the city. For those who love to eat great food, the hotel prepares a wide range of international favourites and a wonderful buffet breakfast.